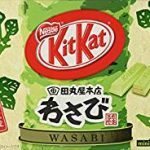 Where can I buy all the Japanese Kit Kat flavors in USA? 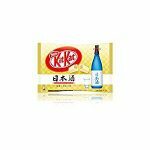 Directly imported from Japan, this awesome package contains a 14 pack of different Kit Kat flavors made by Nestle. You could find all these flavors: Sakura Matcha, Wasabi, Strawberry (Wa-Ichigo) ,Uji-Matcha, strawberry cheesecake, Strawberry (Amao), melon, Rum Raisin, Azuki Bean, Beni Imo (Sweet Purple Potato), Shinshu Apple, Hojicha, Green Tea & Kinako, and Sake! It’s a fun gift for semi adventurous people. Get your pack now for only $25! If you are into particular tastes, you could try one of these individual packages! 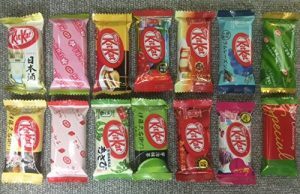 This entry was posted in Anything else and tagged Azuki Bean, Beni Imo (Sweet Purple Potato), Green Tea & Kinako, Hojicha, japan, japanese, kit kat, kit kat flavor, kit kats, melon, Rum Raisin, sake, Sakura Matcha, Shinshu Apple, Strawberry (Amao), Strawberry (Wa-Ichigo), strawberry cheesecake, Uji-Matcha, Wasabi on March 18, 2017 by WhereCanWeBuy.